" Success is never permanent, and failure is never final"
yep...and life is short...while stress creeps in every so often...it is soooo important to enjoy this life. This post was supposed to go up yesterday....#worldcancerday but my day didn't even involve getting out of my chair to get a drink of water..I ate one meal and missed my workout...I know I have control over it but I love my clients and I would do anything for them...so here it is a day late... but more importantly helping those who are fighting this ugly disease more and more people are affected...and they are getting closer to home...I recently found out a friend was just diagnosed...and while we don't talk...I have been following her blog...it can happen to any one of us...and it is so important to raise awareness and live each day to its fullest...I am reminded.... So I went home asked my puppies, my cats, and my hubby to give me kisses and was ready to start a new day...because I am blessed to have one. You can check out my friends blog here...she is a strong and powerful women...make sure to send her some love! I love your lipstick and your lip print scarf from Marshalls! 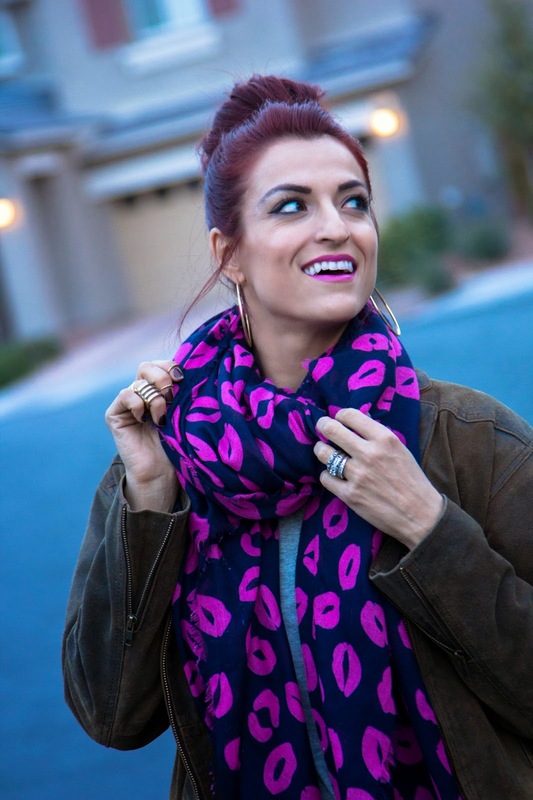 I love the colour, your lipstick looks perfect, the colours match perfectly, and the lip print scarf would be perfect to wear on Valentine's Day! I like your H&M rings and your nailpolish too.